Ridgewood is built on a deep sense of commitment to the success and welfare of our clients. Our goal for each of our clients is to increase their wealth to afford them financial freedom and flexibility. My parents emigrated to the United States from India with me and my little sister when I was 5 years old. Initially we settled in a small 1 bedroom apartment in Jersey City, NJ. From those humble beginnings, thanks to the educational and economic opportunities that this great country provided to me and my family, I have been blessed to work on Wall Street and eventually start my own firm to help others achieve the financial freedom and security that can come from wise investing and financial management. In late 2002, I founded Ridgewood Investments to help others achieve the transformational results that I was able to achieve for myself and my own family using the principles of sound long-term investing that I had learned by studying what works and what doesn’t work. Our approach is based on the successful lessons taught by renowned value investors like Warren Buffett and many other great investors. Ridgewood is committed to the success and welfare of our clients. We believe that each of our clients is a partner or a member of our extended family. Our goal for our clients is to intelligently protect and grow their savings to achieve financial freedom and security. Our approach is a turnkey, outsourced solution that allows you to hand over the time-consuming responsibilities of making difficult investment and financial decisions to a team of trustworthy experts who are watching out for your best interests. The best way to determine whether our approach could help you transform your own results is to chat with us about your own unique situation. Our investment reviews are comprehensive and informative. Whether or not you decide to work with us, we guarantee that you will come away with some actionable ideas and strategies that you probably didn’t know about. 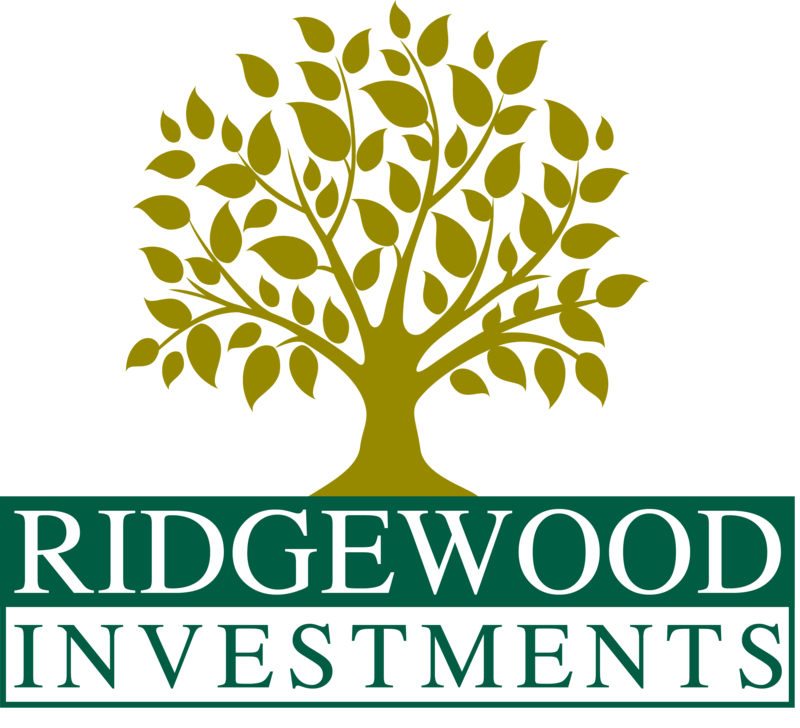 Ridgewood Investments is a privately-owned owner-managed company. As a partnership of highly experienced professionals, our structure is aligned with our focus on delivering long-term results for our clients. Unlike firms that focus on quarterly results or need to show constantly growing earnings in the short-term, our firm is designed to take a long-term and sustainable view towards our investment strategies and our business performance. Our investment philosophy and approach draw upon our partners’ years of experience managing investments across numerous market environments on an institutional scale and models the successful philosophies, practices and insights of outstanding investors like Warren Buffett, Philip Fisher, Benjamin Graham, Bob Kirby, Peter Lynch and others. One of our primary goals is to help our clients achieve outstanding long-term investment performance through the application of proven principles based on a sound and timeless investment philosophy. "Traditional wisdom is long on tradition and short on wisdom"
The key to successful long-term investing is to take a very “business like” approach to making capital commitments. Being business like means doing your own homework, working hard at your chosen field of activity, thinking for yourself, trying to identify proven methods, and understanding and focusing on the fundamentals that you can control. Successful investing must be seen as a serious endeavor worth pursuing and honing with intensity and consistency over time. At the core of our investment philosophy is a belief that a value-based and value-conscious approach to committing capital is a key prerequisite for long-term investment success. Even a great business can sometimes be a poor investment, if the price paid is too high. Correspondingly, we believe that some of the best investment opportunities are found in areas that are currently overlooked and thereby offer attractive prices and total return potential. "Only buy something that you’d be perfectly happy to hold if the market shut down for 10 years"
We emphasize and focus on the long-term results of our investments. We often think about investment time horizons in rolling five- to ten-year periods of time, though in practice longer or shorter periods will also arise. The reason we emphasize the long term is because we believe that worthwhile investment success is built over a long period of steady compounding and is rarely built overnight. In building our investment portfolios, we look to compound our investors’ and our own capital over time while working to mitigate unnecessary risk. By risk, we mean permanent loss of capital as contrasted with temporary stock market price fluctuations. In this orientation, we are also different than the majority of advisors and individuals. Although volatility is often equated with risk, we believe that volatility can also create opportunities for long-term investors. For example, we are happy to see an increase in intrinsic value accompanied by a short-term price drop in one of our investments, particularly when we can use the opportunity to build a position further. "Most investment managers would produce better returns for their clients if they completely ignored current market price"
Part of having an edge is having a superior ability to understand and identify both opportunities and pitfalls associated with a given business. However, investing is a competitive activity and competition has a tendency to reduce the profitability of any edge over time. One important bedrock principle we emphasize is to limit our investments and activities to areas within the investment universe which we think we can understand, a concept referred to as sticking to our own circle of competence. We believe there is much more to investing than just the numbers associated with a given opportunity. In fact, historical numbers are only relevant to the extent that they foreshadow what is yet to come. At least as important is an understanding of the qualitative factors and policies that will create the future financial performance that will drive our investment results in the future. The qualitative factors include such things as the nature of the business and culture of the company, the quality and character of the people managing the business, and the capital allocation policies that they are likely to implement in the future. Kaushal “Ken” Majmudar, CFA founded Ridgewood Investments in 2002 and serves as our Chief Investment Officer with primary focus on managing our Value Investing based strategies. Ken graduated with honors from the Harvard Law School in 1994 after being an honors graduate of Columbia University in 1991 with a bachelor’s degree in Computer Science. Prior to founding Ridgewood Investments in late 2002, Ken worked for seven years on Wall Street as an investment banker at Merrill Lynch and Lehman Brothers where he has extensive experience working on initial public offerings, mergers and acquisitions transactions and other corporate finance advisory work for Fortune 1000 companies. He is admitted to the bar in New York and New Jersey though retired from the practice of law. Ken’s high level experience and work with clients has been recognized and cited on multiple occasions. He is a noted value investor who has written and spoken extensively on the subject of value investing and intelligent investing. He has been a member of the Value Investors Club – an online members-only group for skilled value investors founded by Joel Greenblatt, SumZero – an online community for professional investors, and has also written for SeekingAlpha – among others. Ken is active in leading professional groups for investment managers as a member of both the CFA Institute and the New York Society of Securities Analysts. Terrance has been professionally investing in dividend growth stocks for over two decades. Prior to Ridgewood Investments, Terrance was a Senior Vice President at The Capital Group Companies, Inc. where he served as a Portfolio Counselor in The Growth Fund of America and the SMALLCAP World Fund. Terrance has also previously covered several industries as an Analyst at Capital, including cruise lines, gaming, hotels, semiconductor capital equipment, semiconductors and test & measurement companies. Terrance received his MBA, with distinction, from Harvard University Graduate School of Business Administration in 1998. He received first and second year honors at Harvard Business School as well as a Distinguished Teaching Award for his work with undergraduates at Harvard University. Prior to business school, Terrance worked as a lawyer at Testa, Hurwitz & Thibeault, LLP in Boston. He received his JD from Harvard Law School in 1994 and was admitted to the Massachusetts Bar that same year (now since retired). Terrance received a BA in Economics and Rhetoric, with honors, from the University of California at Berkeley in 1991. In addition to his work with Ridgewood Investments and Dividend Growth Partners, Terrance also serves as a Trustee for the Boston Athenaeum. Sam Namiri is a Portfolio Manager and Analyst at Ridgewood Investments, where he concentrates on managing the Ridgewood Select Value Fund, our fund focused on investing in small and micro-cap companies. Prior to Ridgewood, Sam was an associate at Grand Slam Asset Management, a Small Cap Hedge Fund and also the Founder and President of Shop Network, a jewelry company involved in television, media, manufacturing, distribution and e-commerce. He led the company in producing a reverse-auction television show selling jewelry which aired on DirectTV, started a plant overseas to manufacture semi-precious gemstone jewelry, and developed a global supply chain. Mr. Namiri has a BS in Industrial Engineering and Operations Research from the University of California, Berkeley and an MBA from Columbia Business School. Valerie has a passion for educating clients and helping them prepare for and take control of their financial futures. Prior to her current position, Valerie spent eight years at The Capital Group Companies, Inc. as an Equity Research Associate. At Capital, she was a key contributor to research coverage across a wide range of industries including technology, chemicals and agriculture. Prior to Capital, Valerie was a technology investment banker at SG Cowen Securities and Neveric Capital. Valerie is a CFA charterholder and has an MBA from the Haas School of Business at UC Berkeley and a BA in International Relations from Stanford University. Dina works directly with clients in addressing their client service and account related needs. Prior to joining Ridgewood, Dina was an Administrator in the Equity Research Department at Morgan Stanley. Dina attended St. Johns University in NY and completed a certificate in secretarial studies from Katherine Gibbs School in NY. Brittany works closely with clients to assist in the daily management of their financial needs. In addition to her direct work with clients, she has primary responsibility for Ridgewood's external communications, including our educational seminars, marketing materials and community relations. Prior to joining Ridgewood Investments, Brittany worked for several years at a community bank including the roles of Personal Banker and Marketing Assistant. She has a BA and an MA in Public Relations from California Baptist University.